Tae Kwon Do increases focus while your child is having tons of fun! Teaching children to stay focused is one of our specialties. With classes designed specifically for 4 and 6 year olds, your child will learn the importance of eye contact, posture, and active listening skills that will benefit them not only in Tae Kwon Do but at home, too. Tae Kwon Do students have an easier time concentrating and are able to control the fidgeting that often takes other children off track. Tae Kwon Do builds confidence! Is your son or daughter a little bit shy and need some help coming out of their shell? Tae Kwon Do builds confidence by teaching children how to persevere through challenges, show enthusiasm, and maintain a positive attitude. With confidence, a child knows they can meet any challenges ahead. By seeing their skills improve and goals become reality, children gain a sense of accomplishment; they feel more in control of their situation, and feelings of helplessness disappear. Tae Kwon Do provides children with the knowledge, attitude, skills, and confidence which continues into their adult lives. Give Your Child the Skills to Succeed in School and in Life! Tae Kwon Do improves listening skills, concentration, and grades! Teaching kids to stay focused is one of our specialties. From the very first class, your child will learn the importance of eye contact, posture, and active listening skills that will benefit them not only in Tae Kwon Do but at home, on the playing field, and of course at school. Both teachers and parents often notice the dramatic difference in children who study the martial arts. Tae Kwon Do students have an easier time staying on task, are more disciplined when it comes to homework and able to control the fidgeting and distracting habits that often take other children off track. Your child will listen better at home, handle homework and chores more efficiently, and put more focus and effort into their schoolwork. Many children also enjoy begin receiving better grades. Tae Kwon Do will boost your child’s self-esteem and self-confidence to new heights! Tae Kwon Do will provide your child with plenty of challenges and the tools to overcome them. You’ll be amazed at the difference just a few months of lessons will make in the way your child will feel about themselves and their abilities. The secret is our use of positive recognition. Our staff consistently use praise and positive feedback in every class to encourage students and motivate effort. Our belt system gives students mini-goals to strive for and teaches kids the power of goal setting. 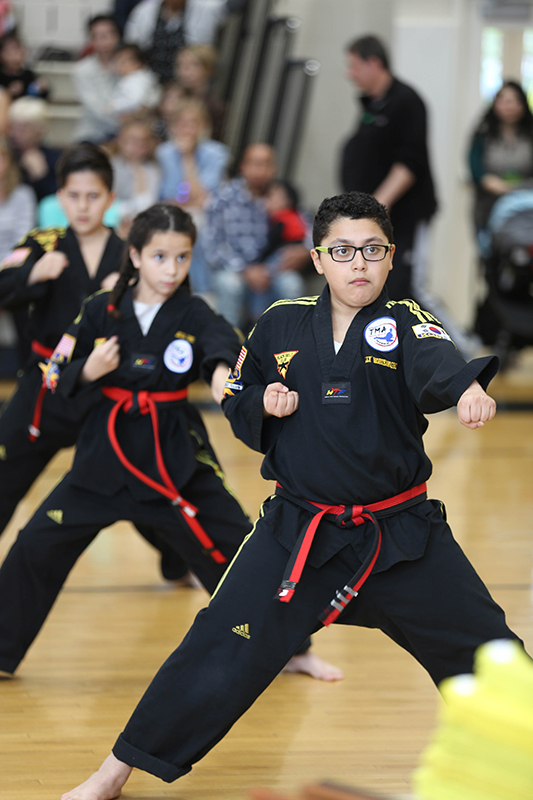 Special events such as belt testing and tournaments give students an opportunity to perform in front of others, further enhancing their self confidence and self-esteem. If you are concerned that your child could use more physical activity, then you’re not alone. Many of today’s kids spend hours in front of TV’s, video games, and computer screens. As a result, few children get the level of activity they need to get and stay healthy. Tae Kwon Do can provide a much-needed physical boost. Kids of all ages improve their balance, coordination and motor skills. They also improve flexibility, strength and endurance, skills that will help them in other sports and make them more confident in their abilities. Best of all, Tae Kwon Do is a fun way to get in shape. Our enthusiastic instructors and high-energy classroom make learning enjoyable as well as rewarding. Your child will look forward to their classes and be eager to attend their classes!